Ahh yes the great outdoors, full of fun and unpredictability! Really, you should be prepared for almost anything when you venture into the outdoors and the equipment you bring should be no different. I like to kayak and paddleboard a good amount but a lot of the times I would find myself in a conundrum. If I bring my backpack (one I had since college and highschool) it will get all wet, but if I don’t bring one for the day paddle, I risk tiring myself out and having to pack it in early because I won’t be able to bring food and water to fuel me. Well I have good news for you, there is such a thing as waterproof backpacks for outdoor use! The best thing about it is that a lot of them are pretty cheap and are perfect for day trips with the family. In your travels you will find backpacks that are water resistant and ones that are waterproof. Water resistant backpacks are cheaper made backpacks using welded seams and nylon fabric to pass it off as water resistant. By definition Water Resistant is simply material that is tougher for water to get in, and by water they mean like a few small drops. It certainly does not mean that it will hold up in situations where unexpected amounts of water pour on to you. This is even more important if you are always in the water be it in a kayak, canoe, paddle board, boat or whatever. Waterproof on the other hand is a backpack that can withstand a reasonable amount of water and not have it’s contents affected. Now I say reasonable because waterproof will not always protect against every single circumstance and condition there is. If you expect drop your bag in a lake and pick it up a week later and expect absolutely zero water to get in then you will be disappointed unfortunately. Still though, waterproof backpacks are good enough to withstand a good amount of water being thrown at them and are the ideal candidates to store valuable contents you have with you that you cannot afford to get wet. The packs below are all waterproof and feature some of the best customer ratings out of any of the waterproof backpacks within their range. They are best for day trips and should be treated as such. You can choose the size as per your need. It comes in two options of 35L and 55L capacity. If you are looking for an overnight waterproof backpack, the 35L one should be enough. If you are planning a longer trip, you can go for the 55L one. The Earth Pak has a padded back support which is ergonomic which makes it very easy to carry and very comfortable, especially if you are out on a boat or a kayak trip. The backpack also has shoulder straps and a sternum buckle. The shoulder straps are made of reinforced mesh so it is strong and yet very comfortable. It also makes sure that the weight is equally distributed so you don’t find the contents very heavy even if you are using the 55L bag at full weight capacity. Most of the customers were happy as the bag is very spacious and durable. The bag can undergo the roughest and severest weather and still won’t leak. Since the straps and the bag are well padded, you can carry the bag easily and comfortably and even if the bag is carrying its full weight, it doesn’t feel heavy. There were some complaints that the backpack tore easily especially the strap and the section between the bag and the front packet. If you are environmentally conscious then the FE Active Eco-Friendly Waterproof Backpack is the one for you. It is environmentally very safe and made of PVC material. The material used to make the dry bag is PVC Tarpaulin which is eco-friendly and is 5mm thick marine grade. The welded stitching ensures that the bag can withstand the roughest outdoor activities. The design of the FE Active Backpack is very compact so it is great for daily use and for water activities. You can use it for a variety of activities including snorkeling, surfing, climbing, and jogging. The backpack is great as a dry bag when you are going backpacking and exploring new places. The capacity of the backpack is 30L and is great if you want to use it as a day pack or an overnight bag. The size is compact so you can fit most of the things you require without it getting heavy or bulky. If you need to carry additional things like water bottles etc, you can use the mesh netting at the side. It has a corded exterior so you can even keep items like camping gear, yoga mats, and any other outdoor equipment. Most of the customers praised the durability of the backpack. It was used in torrential rain and rough weather and yet there wasn’t any leakage. There is enough room on the side to accommodate things like a water bottle for easy access. Some customers mentioned that they had an issue with the straps and that it broke when the weight increased. The Chaos Ready Waterproof Backpack is a very high-quality, heavy duty dry bag. It has shoulder straps that are padded and have side pockets made of mesh. It has a front pocket to keep items that you need to access easily. The main compartment of the backpack is 100% waterproof. It will protect your things from dust, dirt, sand, and water. It can float easily if it falls into the water. Since the backpack is made from 500 PVC heavy duty tarpaulin materials and has seams that are welded at high frequency, the bag is very durable. The Chaos Ready Waterproof Backpack is easy to use, easy to clean and easy to store. It has a folding system that makes sure that the main compartment is airtight and watertight. Another great feature of the backpack is that the mesh sides and front pocket can accommodate your waterproof accessories like your gloves or swimwear. If you are not happy with the backpack, you can avail of their lifetime warranty and their money back guarantee which makes it a 100% risk-free purchase. Most of the customers liked it because it was very comfortable and you can carry a lot of things in it. Many liked the option of having the pockets for the water bottles on both sides. It also has an easy to access front pocket. They commented that it is compact, easy to roll and seal. There were a few complaints online that the bottom of the backpack wears off fast. These Drybags are great for compartmentalising everything you need into sections. They are ideal for kayaking, paddle boarding, canoeing as well as hiking/ general rugged travel use. When it comes to a budget waterproof backpack which is economical and durable, nothing can beat the Marchway Floating Waterproof Dry Bag. Starting at less than $10/-, the backpack comes in a variety of sizes depending on your need. It is a roll top backpack which can be used to keep your gear dry when you are kayaking, boating, rafting, swimming, hiking, camping, on the beach or if you are going fishing. It comes in a variety of weight capacity right from 5L to 40L. The backpack is durable and is designed so that it is puncture proof. It is completely waterproof and is very easy to clean. It has a strong exterior and can protect your things from water, mud, snow or sand. The Marchway Floating Waterproof Dry Bag is very easy to use and you can just roll it up tightly for about five times and then put the buckle on top and you have a watertight backpack. Even if your bag falls into the water if you are kayaking, you don’t need to worry about your things getting wet. The backpacks are lightweight and are very durable along with being fully waterproof. Even if the bag falls in water, the bag will still float. You don’t have to worry about losing your things as it won’t capsize. Most customers were very happy with it and used it as a dry backpack when they went kayaking or even on a motorcycle in the rain. The main backpack is very durable and doesn’t tear even with rough use. You can choose the size you would need and is very cheap. Some customers mentioned that though the bag wasn’t fully submerged and was in their kayak, the water still leaked into the bag. • The straps are not very comfortable so it is not suited for hiking, etc. The Earth Pak waterproof dry bag is a roll top compression sack. It keeps your gear dry when you go out for a kayaking trip. You can use it when you are out on the beach, for rafting, hiking, boating, and camping. It also comes with a free phone case that is waterproof. The Earth Pak waterproof backpack comes in a lot of options. You have 4 weight capacity options that you can choose from i.e. 10L to 55L. It comes in eight different colors. The backpacks are very strong and are made of 500D PVC material. They will last many years and they give excellent waterproof protection. The shoulder straps of the backpacks which are in the 10L & 20L range are single and have a length of 24-42 inches. The 30L, 40L, and 55L backpacks have double shoulder straps i.e. a sternum strap which gives you more stability. The IPX8 certified waterproof phone case comes free with the backpack. It can fit large phones too easily as it is 6.5 inches big. It has a snap and lock mode to open it and has clear windows on both sides so you can click photos even if the phone is in the screen. Most of the customers loved the backpack. It is light, cheap and very durable. The phone case too is great and there are many customers who mentioned that though the phone case fell into the water, the phone wasn’t affected at all. It floats in water. There were a few negative comments about the attachment of the shoulder strap that it comes out easily and is not stitched well onto the backpack. Weighing just 9.6 ounces, the S& P waterproof backpack is an excellent lightweight budget backpack. It is very durable as it is specially developed from an army design. It has extra density and is made of nylon fabric that is water resistant. This gives it extra strength and durability along with ensuring that the weight is light. The backpack is reinforced at stress points with bar tacking. This ensures that the life of the backpack is longer. It has a 2-way SBS Metal Zipper which is durable and abrasion resistant on all the zippers of the backpack. The backpack has mesh straps which are thick. It also has sponge padding in the straps so that you don’t get stress on your shoulder. Most of the reviews online were positive. They liked that the bag was lightweight and compact. They liked that it had compartments and that you can keep two water bottles in the mesh pockets outside. It is very spacious and many found that it was great when they used it for cycling, hiking, and motorbike riding. They even took it on flights and found it great for traveling. A few reviewers had an issue with the size (that it seemed smaller than expected) and with the durability of the backpack. 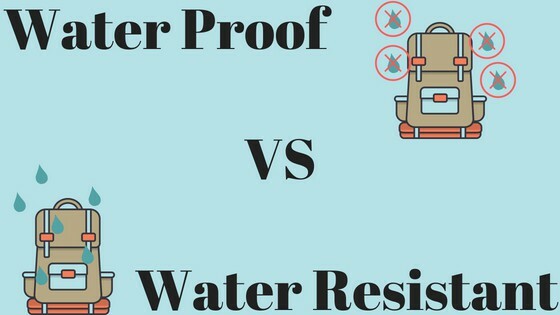 Here are a few different criteria that you can use when comparing the best waterproof backpack for outdoor use that will best suit your needs. Size is dependant on how long you tend to be trekking for. The bags we have rated above are best for day treks. If you plan on doing multi- day trips you will start looking at good quality packs that start going $100 and over. Great for compartmentalising everything. These are usually top picks for kayakers that do multi day trips because they can maximise the space in their kayak with many different bags instead of one giant one. These are also great those who are out for a few hour and just want the essentials with them. These are ideal for day trips where you don’t need the burden of carrying a full set up like a sleeping bag, tent ect. These kinds of bags you can simply just throw over your back or throw it on the hull of you kayak as you go on your day paddling trip. Waterproof backpacks can be made from a wide variety of different materials but usually the most waterproof kind are made of some sort of PVC material. This is the same material that coats a lot of different kinds of inflatable kayaks and paddle boards that allows them to be both leak resistant and highly durable. Other acceptable materials include nylon and tarpaulin. Closure means much more than just the therapist sitting you down and you having an epiphany! In terms of waterproof backpacks closures represent how the bag is closed and therefore protected from the elements. There are several different kinds of closures that all have a wide variety of different advantages and disadvantages. Not the most effective thing to use for a backpack, metal zippers can often break. Sometimes even in situations where you don’t need them to. Roll Down Bags are the most popular and equally one of the most effective waterproof dry bag closure systems there are. Once you have filled the bag with the equipment you need simply start rolling it down to take air out of it as you roll. You next click the buckle to insure the waterproof seal. Almost all dry bags use this technique. Some also include a layer of velcro to complete the seal. So, what makes a Good Waterproof Backpack? It has to be waterproof! Materials make all the difference in this metric so make sure that they can provide a waterproof seal each and every time. If it a really low cost item then materials will be cheap and your waterproof backpack will turn into a wet sack. Remember back in school where you used to throw your backpack into your locker and eventually a zipper or a hole would appear? Well think of it as having to be at least 10X more durable than that. The outdoors is a harsh mistress and as you can imagine things will get thrown, knocked, rained on and snagged. Make sure that they are made of at least 500 Denier PVC, Nylon or tarpaulin materials to insure that it will not leak. Anything attached such as zippers, clips, D rings must be well built. This is often very overlooked but the results can be catastrophic as a lot of these features are actually connected with the effectiveness of the bag. What Should you pack in your Waterproof Backpack? It can be a bit overwhelming trying to figure out what to pack so here are some of the essentials. A lot more different ideas over at REI in case you wanted to do a multi day kayaking trip. Let us know how you like to pack for outdoor excursions!